I’ve been keeping busy this past week making tons of freezer meals. But with lunch in mind not dinner. I will share all those recipes with you on Wednesday that I have made. There are a lot of sites out there that have ideas for meals that freeze well but my favorite so far is Freezer Friendz. Do you have a favorite site with good ideas for meals to freeze? 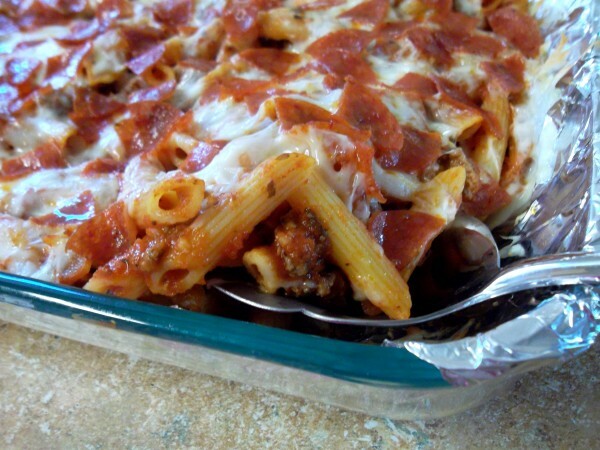 This pizza pasta is great just to make any night for dinner. It’s simple, quick and so yummy! To freeze it you can either freeze it in a 9×13 pan or if you’d like it to be individual portions you can freeze it in a container that can be heated in the microwave. This is a great idea for lunch. If we have leftovers from dinner that is what we eat for lunch but when we don’t sometimes I don’t know what to make. I can always make something but Derek needs to have something ready for him to take to work so he doesn’t have to rely on fast food. 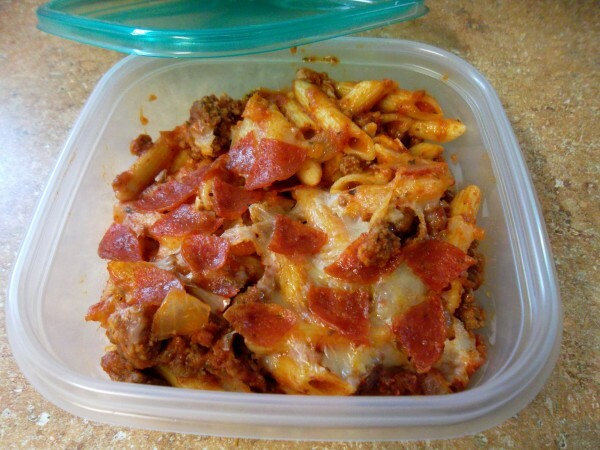 I love this pasta because it’s a basic yummy meat/pasta/sauce combo with an added twist of pepperoni. It’s really good! And just an important note. Please please please do not overcook the pasta! 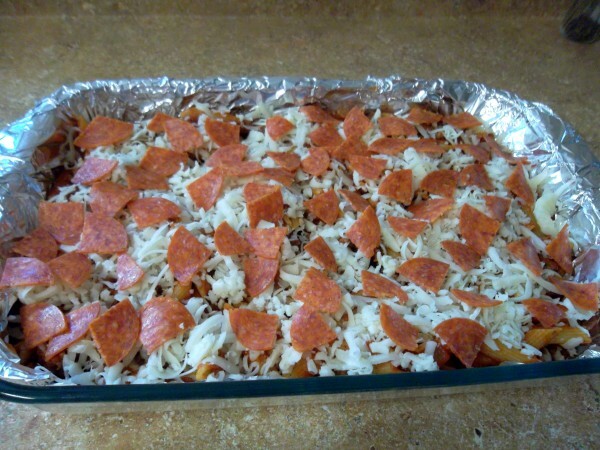 Since this recipe will be baked in the oven it needs to be cooked until al dente if not a little less. This usually tends to be 1-2 minutes less than the package directs to boil the pasta. In a large skillet cook meat and onion until the meat is thoroughly browned. Drain fat. Add pasta sauce and cooked pasta, stirring well. Place mixture in a 9×13 pan. Top with 2 cups cheese, then top with pepperoni. To bake immediately: Preheat oven to 350 degrees and bake for 25-30 minutes or heated through. Serve. To freeze: Cover and bake in freezer. To freeze in individual portions: Bake pasta for about 20 minutes then place small portions in containers that can be reheated in the microwave. To thaw and cook: Thaw overnight in refrigerator. Preheat oven to 350 and bake 35-40 minutes, or until heated through. Serve. Which would be best to do? Can I bake it than cool it down, freeze, defrost then reheat and won’t be mushy too? Thank you! Either way works just fine. The last time I made it I baked it first, let it cool then froze it. When we pulled it out of the freezer to eat it, it was great! It’s not mushy at all. The most important thing to do is when you are boiling the pasta do not overcook it. Make sure it’s al dente.